Motorola's latest and greatest Moto X has generally been lauded by everyone for its unique customizable colors and performance but the $200 price tag on contract has often raised questions, especially considering you get much more powerful smartphones such as the Samsung Galaxy S4 and the HTC One for the same price. It seems Motorola is aware of this and is planning a price drop in the near future. evleaks has revealed that the Moto X will be getting a price drop in Q4 this year and will drop down to $100 on a contract. 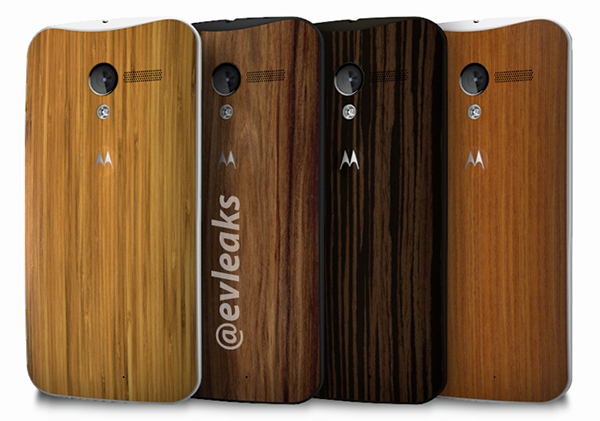 Moreover, the wooden panels that Motorola showed off when the device was announced (but are not yet available) will be available around the same time for a $50 premium. You can see the four panel options that will be available through Moto Maker later this year. This phone is such a fail. One network in America is the only way to enjoy the features that make it premium. No way Moto will make money off this. why wood, i preffer a spotted color, black and white. i dont like it..